Let a Portable Shade Umbrella Protect You From Roasting Your Skin! Roast a beautiful turkey and not your skin! Happy Thanksgiving! It’s that time of year again! The time of year where you can stuff yourself with all kinds of delicious food with people you love most in your life. It’s Thanksgiving! And this year we also hope you have a lot of things to be thankful for. Perhaps you’re thankful for your job, your friends, good health, and your family. Maybe you’re thankful you have a break from school or work for a few days due to the holiday. We couldn’t agree more! We all deserve a break to reflect and enjoy all our blessings. The best part of Thanksgiving for most people is the Thanksgiving feast! Preparation of the turkey and side dishes is half the fun of the days activities, although I must admit I enjoy watching the Macy’s parade too! Most people roast a turkey only once a year. And, if this is true for you, we’d like to offer a few suggestions. Here is a step-by-step instructions on how to roast your turkey … not your skin! 2. 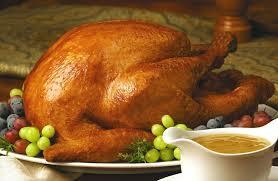 Remove turkey from its wrapping and remove neck and giblets from inside the cavity. Set aside to make gravy later. 3. Rinse turkey inside and out with cold water. Pat dry with paper towels. 4. Put oven rack on lowest level of oven. 5. Place turkey, breast side up, on a roasting rack in a roasting pan. 6. Rub the outside of the turkey with olive oil. 7. Salt and pepper the turkey’s body and cavity. Use the salt and pepper to taste. Remember, if you add too much you may ruin the taste, but you can always add extra water later. 8. Roast turkey about 3 hours, or until meat thermometer inserted in the thickest past of the thigh registers 175 to 180 degrees F.
That should make you a delicious turkey! It’s important that you roast your turkey and not your skin. Stay protected with a portable sun shade umbrella with a tripod stand that also serves as a UV blocking umbrella. Remember to not roast your skin like a turkey this year! Apply sunscreen and enjoy your Thanksgiving Day!